We recently had a great post on what museums do in video games. This got me thinking about another tried and true feature of public history which shows up in all kinds of video games, monuments and memorials. So this is a quick run at a few examples of memorials as represented in video games. I think the procedural rhetoric for representing these objects offers a unique opportunity to consider their cultural meaning. 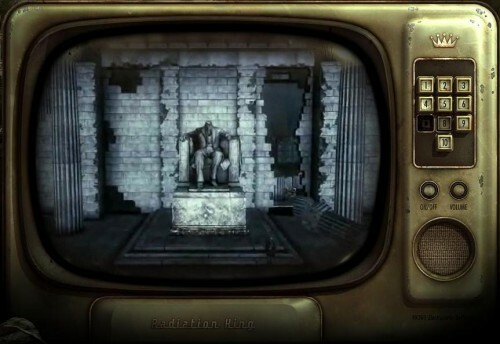 Among the many fascinating things in Fallout 3, there is a whole side quest sequence built around putting Lincoln’s head back on his statue. Slavery has remerged in this post apocalyptic world and the Lincoln Memorial has a part to play. As the player, you have the option to help a group of ex-slaves take over the memorial from the slavers. So, restoring the monument serves as an opportunity to enact part of the values that the memorial represents. That is, the virtual representation of the commemoration serves to reinforce the things that the site memorializes. Those of us who grew up with the game Oregon Trail will remember how the landscape of the game became littered with the tombstone memorials of the various players who went before us. 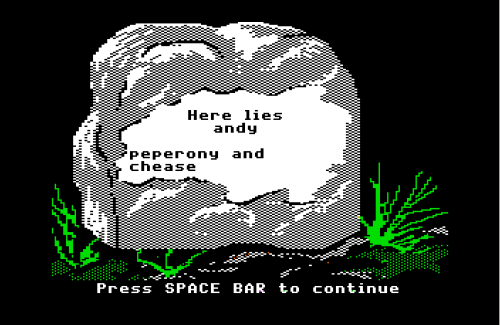 These tombstones are popular enough that there is a free web based Oregon Trail Tombstone generator. What made the tombstones fascinating was their persistence. What you wrote out for your characters on their tombstones persisted into the games of future players of your particular copy of the game. It’s like a grim kind of scoreboard that created a layer of interaction outside individual plays. Along with that, it made the game function as an ongoing world. These graves enacted the passage of time in the game. Each play apparently happening after the previous as the deaths, and often absurd messages, piled up along the trail. Piracy resulted in one of these tombstones taking on a cultural life of it’s own. Because the tombstones were saved to the disk and many people played on pirated roms of the game, many players would come across this particular instance of the tombstone pictured above. 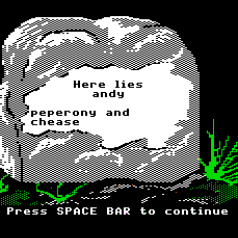 “Here lies andy; peperony and cheese.” Apparently an attempt at a joke about Tombstone (pizza). So some player’s joke was written into a copy of the game which became the basis for a bunch of pirate copies of it and as a result the monument that player wrote into their local copy of the game has become a commemoration which took on a life of it’s own as a meme outside the game world. Built to commemorate the “Sorceress War,” an event which happened in the past of the games fictional world, the Soreceress Memorial also functions as a place to seal potentially dangerous sorceresses. So aside from commemorating an event it’s actually a plot device and potential prison. It is a space that’s original meaning was forgotten until it is activated again. It was actually the instrument that ended the war, not a commemoration of it but it’s original intention was forgotten and it took on meaning as a memorial. 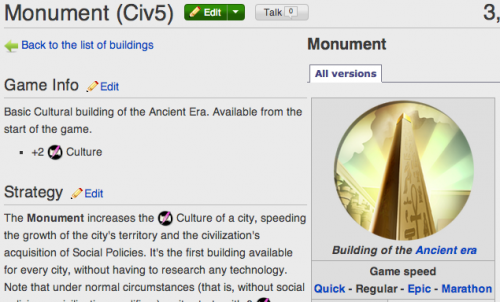 There are a ton of monuments and memorials in the various versions of the Civ games. What’s neat about these is that they are actually tools that have particular social power and value ascribed to them as metrics associated with them. The most basic, the generic monument itself, gives you 2 points of culture a turn, which works to both the range of your cultural influence and the land you control and serves to the cultural victory condition in the game. What do in game monuments and memorials do? Just from these quick examples, in game monuments and memorials do a lot of things. They act as ways to layer in a sense of the past and history into fictional worlds. They serve as explicit resources to use for in game metrics. They can bring in historical meaning by connecting with actual physical monuments. I’m curious to get a bunch more examples here. 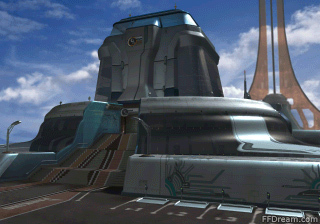 So what are your favorite in game monuments and memorials? To what extent do they work like the ones I’ve mentioned here. “[A] way of enhancing memory is to develop collective memories of events, people and places. Virtual memorials offer a variety of methods of doing this. First is the online page or site where people can add their memories, pictures and footage of a person or event. Some of these are fixed, so that only the original authors can add to them; others encourage participation and sharing, allowing people to collaborate to develop a shared representation of the past that can be changed and developed over time. “History pin /http://www.historypin.com/ is a site set up to do this in an overtly historical context; current projects include the Fall of the Iron Curtain, Hurricane Sandy and the First World War artworks owned by Britain’s Imperial War Museum. In the case of the latter, the shared resource that is constructed in this way can be used to augment study of the physical artworks within the museum. “Memorial and memory projects also offer augmentation when they extend into virtual environments, immersing visitors and allowing them to experience an interpreted past in new ways. The multiplayer online role-playing game, World of Warcraft, includes multiple memorials. Early memorials required players to search for resources outside the game in order to understand them fully. More recent ones have a quest structure. They tell a story about the past that is built by the game designers and enacted by players, usually in memory of an individual who is now dead. These quests involve extended interaction with the memorial narrative. In their development of these, ‘the designers have set out to draw on an intertextuality of cultural material and human experience to create emotional journeys that speak to profound issues’ (Gibbs et al., 2012). “The Wall SL was a tribute to the famous Vietnam Memorial in Washington DC. The virtual site reproduced the wall, but also added new features: a synthesized text reader recited the names of the war dead that are inscribed on the wall, while music of the period became the location’s soundtrack. ‘All Along the Watchtower’ played in the background, and the season was perpetually winter. Collaboratively edited and authored, Play the Past is dedicated to thoughtfully exploring and discussing the intersection of cultural heritage (very broadly defined) and games/meaningful play (equally broadly defined). Play the Past contributors come from a wide variety of backgrounds, domains, perspectives, and motivations (for being interested in both games and cultural heritage). More information on all of our contributors can be found here. A full rundown of our community and commenting policy can be found here. If you are looking to get in contact with us (for whatever reason), point your browser here and drop us a line.